As March rolls on, the focus shifts to the NCAA Tournament and players with NBA potential. While we all know stars like Zion Williamson and RJ Barrett, Sports Illustrated provides info on the best players available in every first-round game. As the NCAA tournament tips off this week and everyone’s attention shifts to college hoops, NBA draft night, June 20, inches ever-closer. Whether you’re an NBA fan hoping to catch a glimpse of your team’s potential draft picks or a college diehard just trying to make sense of the landscape, we’ve prepared a guide to every first-round matchup, beginning with tonight’s First Four games. This is part one of an ongoing series—we’ll revisit the second-round matchups going into the weekend, and circle back before the Sweet 16. Our ranking of the Top 80 prospects can be found here, and we’ll have a new mock draft on Wednesday. For the next few days, keep this bookmarked. All tipoff times are Eastern. Yes, we’re leaving out the 16-seed play-ins. There’s actually a good level of intrigue in Dayton this year, starting with this game, which Belmont should be able to handle. Windler is a lethal shooter with a quick release and deep range who has a solid chance to get drafted, and if his team can win this one and play spoiler during the first weekend, he could be one of the tournament’s breakout stars. They’ll get Maryland with a win here, and potentially LSU after that. This is another game worth watching, with a potential first-round pick in Dort and possible second-rounders Ponds and Cheatham also on the floor. Arizona State has athletic guards and should send pressure at Ponds, who is his team’s primary source of offense. Dort will likely see a lot of Justin Simon, who was perhaps the top defender in the Big East this season. Expect this one to be unpredictable. The winner would get Buffalo, a palatable draw, and have a chance to make noise. This shapes up as a solid early matchup that should be a good platform for Nwora, who is playing his way into the draft picture with hot three-point shooting, although he’s coming off a dud against North Carolina in the ACC tournament. Minnesota is a fairly staunch defensive team and just shut down Purdue’s Carsen Edwards in the Big Ten tourney. Expect Nwora to see a lot of Amir Coffey, the Gophers’ top perimeter defender and a prospect with more to prove. 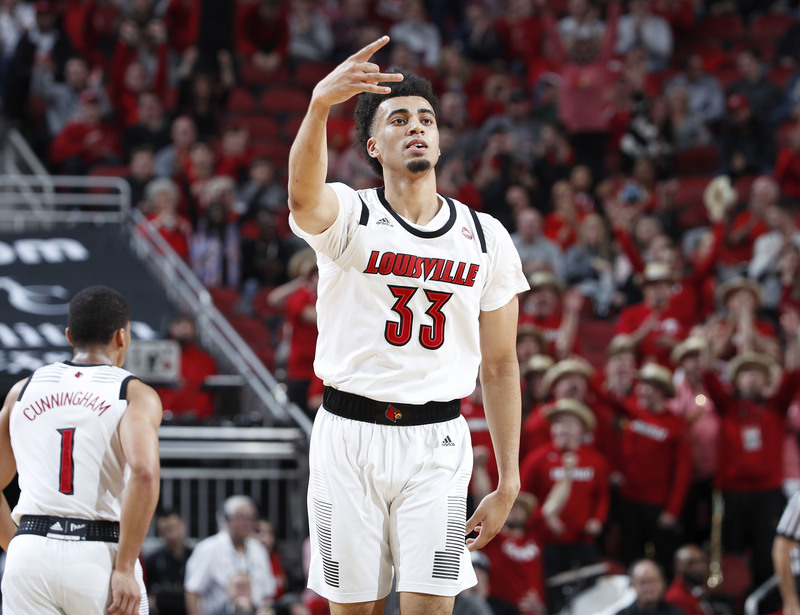 If Louisville is going to make any noise (particularly) with Michigan State looming, it will coincide with Nwora putting on a long-range display. Also keep an eye on toolsy 6’10” Gophers freshman Daniel Oturu, who has some long-term NBA intrigue. Either LSU will roll to the Sweet 16, or there are going to be some nail-biters—the Tigers are without suspended head coach Will Wade, but have a lot of talent on the roster, albeit no one prospect scouts feel great about at this stage. Reid comes off one of his best games of the year (26 points, 14 rebounds) in LSU’s SEC tournament loss to Florida, but has generally left scouts wanting more all season. If the Tigers pull together and win a couple games, he stands to benefit most from the platform and showcase his array of skills. Also keep an eye on Oni, a second-round prospect this year with intriguing tools. He can leave a good impression against legit NBA size in this one. Auburn is red-hot after winning the SEC tourney, and Okeke has the type of versatility that could land him in the first round with a strong predraft process. Few college players possess his mix of perimeter shooting (37% from three), rebounding ability (3.5 offensive, 5.0 defensive per-36 minutes) and defensive savvy (2.1 steals and 1.5 blocks per-36), and he’s shaping up as an ideal stretch forward for the modern NBA. His offensive contributions haven’t always been spectacular this season (Jared Harper and Bryce Brown dominate the Tigers’s possession tree), but Okeke is their most important player. A Sweet 16 run could be a big opportunity to impress, but they’ll have to handle New Mexico State in what should be an uptempo, exciting game. Kabengele, the nephew of the legendary Dikembe Mutombo, isn’t quite the same caliber of shot-blocker, but he’s become a formidable sixth man (in name only) for the Seminoles and has built a bit of buzz among NBA types. At 6’10”, he contributes on the glass, protects the rim, can space the floor when called upon, and brings a nice level of versatility for such a big-bodied player. He’s playing the lion’s share of minutes over 7’4” Christ Koumadje, and is the key to FSU’s post-season success. Also take a peek at Vermont’s do-it-all forward Anthony Lamb, who is his team’s best scorer, rebounder, passer and shot-blocker and is still only a junior. Although the odds aren’t necessarily stacked in his favor, Winston looks like the type of plucky college playmaker worth betting on, and he’s got the keys to an overachieving Michigan State team that should be slated for the tournament’s second weekend. If you can get over his squat body type, Winston is deceptively quick, alarmingly smart, and playing close to mistake-free basketball right now. He’s only a junior, and don’t rule him out as a useful pro. Think about…an entire career…of late-career Ray Felton. After stumbling against a desperately undermanned Nebraska team in the Big Ten tournament, Maryland is on upset notice, particularly if Belmont advances on Tuesday. No matter what, the Terps’ frontline is going to create an advantage, with the bruising Fernando a potential first-round pick and Smith facing a stay-or-go decision as his freshman season winds down. This should be a decent look at both, particularly Fernando, who will be keyed on by opposing defenses, but has the ability to dominate just about any game on the glass. It’s inarguably a weird year for Kansas, and Northeastern is a strong 13-seed, so this is kind of sink-or-swim territory for a team that peaked early and has essentially replaced Udoka Azubuike (injured) and Lagerald Vick (MIA) with freshmen Agbaji and David McCormack. Agbaji, incidentally, looks like Kansas’s best long-term prospect, but has said he plans to stick around another season. The situations of Grimes (underwhelming), Dotson (undersized) and Lawson (perhaps underrated) require more clarity. Lawson has the least left to prove, and is probably the key to Kansas making the second weekend (which would comfortably send them to Kansas City). If you watch one game on Thursday, it should probably be this one: likely top-five pick Ja Morant (our No. 2 overall prospect) gets a terrific test against Marquette and high-scoring but undersized Markus Howard. While it seems unlikely that those two will defend each other most of the game given their offensive workloads, this should be an uptempo game between two teams who like to shoot threes, and a nice opportunity for Morant to prove himself to anyone who still hasn’t hopped on board. The Racers would be a fun cinderella. Howard has been banged up toward the end of the season, and his height and average playmaking skills might be a long-term impediment in the pros, but he’ll be an entertaining foil for Morant, and can still go off at any time. This should be a sneaky-fun game between tournament-tested Nevada and a Florida team that’s peaking at a good time and was awfully close to winning three games in the SEC tournament, including a last-second win over Auburn. The Gators’ freshman duo of Nembhard and Johnson are more for the long-term, but Nevada’s seniors are nearly out the door, with Caroline, a gifted rebounder who’s added a reliable three-point shot, having emerged as a potentially intriguing role player. The Martin twins will be 24 this year and offer limited ceilings, but are still dangerous catalysts for the Wolf Pack. 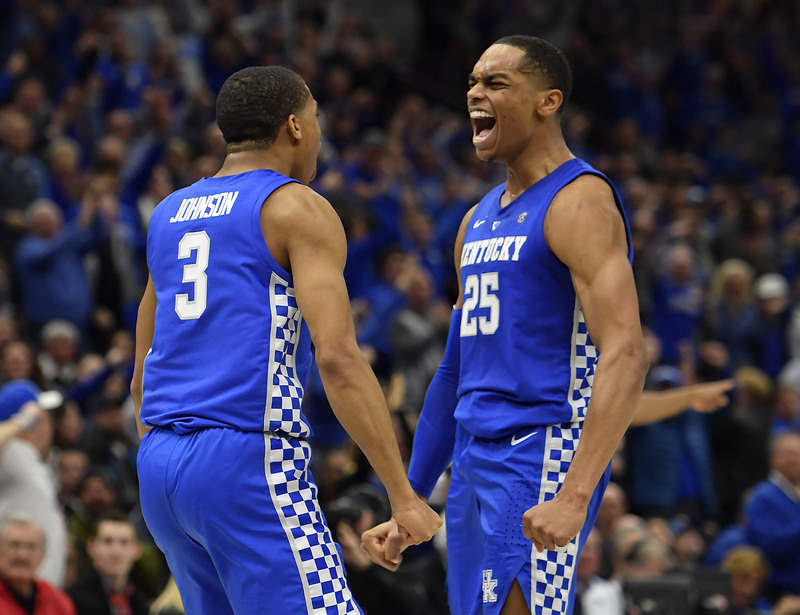 If you haven’t watched any Kentucky this season, catch a glimpse of their three projected first-rounders here. This one might be over quickly, and you may not have to linger too long. Villanova doesn’t have quite the talent level of years past and could be upset-prone in this one, but they’re reliant on Paschall, who’s expected to be drafted, for a good deal of the dirty work. The Gaels have a sleeper in Fitts, an athletic, well-rounded forward who should match up with him a good bit. Phil Booth (Villanova) and Jordan Ford (St. Mary’s) give this game a pair of high-scoring guards, as well. This should be a breeze for Gonzaga, who have a slew of draftable players, and should be much more watchable in the rounds to come. Keep an eye on Tillie, who’s been injured and needs a good few weeks to prop up his stock a bit. Michigan could make a deep run in their region despite the lack of any surefire NBA players; Poole has established himself as the most intriguing. He’ll need to make good decisions and continue showcasing expanded off-dribble skills, but he can get hot from three quickly and has a chance to play his way into this year’s draft if all goes well this month. Two under-the-radar shooters feature in this one, both of whom have had terrific seasons, yet neither being a clear NBA fit. Magee doesn’t pass the eye test, but has proven he can hit insane degree-of-difficulty shots from outside, and has the potential to be one of the tournament’s breakout players. He won’t be able to defend anyone in the pros, but he might be a good enough shooter to get a chance. Powell has turned himself into one of the most potent scorers in the country, but as a 6’2” two-guard may have to go in through the back door, as well. Edwards has been entirely feast or famine this season, with his scoring efficiency taking a major dip with less talent positioned around him and opposing defenses able to key on him effectively. Purdue’s reliance on his points makes them vulnerable at just about every juncture of the tournament, but also means he could put on a show in every game. He’s a prospect with pronounced strengths and weaknesses, but there are few players as fun to watch on a good night. These two teams play stingy zone defense, creating potential for some abominable basketball. Battle is the guy to watch as he returns from injury and tries to inject some life into his draft stock, which has been trending downward. There’s no one great player to watch in this one, but Cumberland and Cook are both juniors in position to test the waters, though neither may end up draftable this spring. 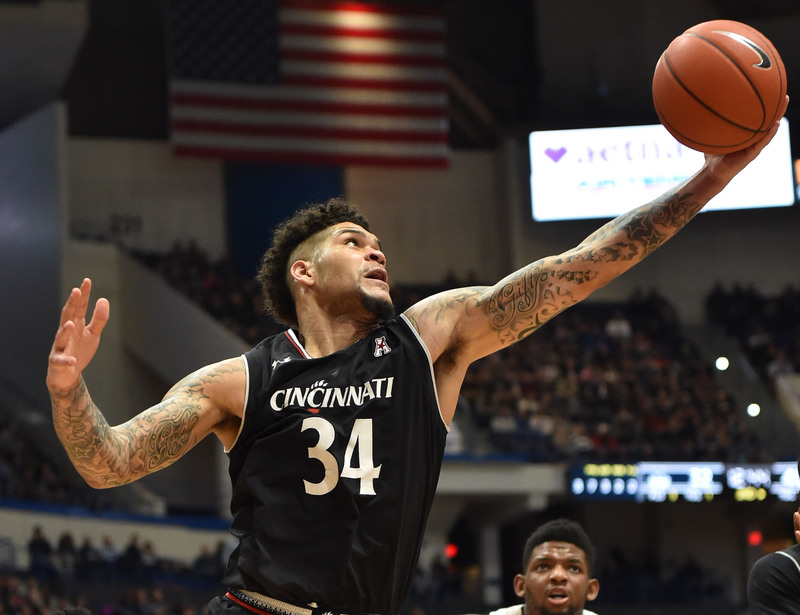 Cumberland is Cincy’s best player and can be deadly from outside. Cook isn’t Iowa’s focal point, but he’s NBA-level explosive and is the X-factor for the Hawkeyes. It’s a small miracle either of these teams made the tournament, with Kermit Davis taking over a basement SEC team and Oklahoma losing Trae Young. This one may not be pretty, but Davis has NBA athleticism and should end up in training camp somewhere this fall. Culver’s had as mercurial a rise as any prospect, now rating as a top-five prospect on our Big Board and boasting a well-rounded skill set. Texas Tech needs big performances out of him to keep up offensively, and this one could be a nice early showcase. Culver might solidify himself near the top of the draft with a big couple of weeks here, and this is a good opportunity to get a feel for him. K-State has a trio of sleepers in Brown, Sneed (who’s a junior) and Wade (whose status is up in the air as he rests a bum foot). While this could be an upset special with UC Irvine set to play in San Jose, the Wildcats are deep, experienced and tough, and that begins with Brown setting the tone. It’s possible none of these guys get drafted, but all three have a chance to punch above their weight going forward. NBA teams are split on the long-term prospects of Williams and Schofield, both of whom are somewhat unorthodox, but have the kind of intangibles that make you want to project them into roles. The Vols funnel offense through Williams inside, while Schofield has developed into a quality pull-up shooter. These guys have had plenty of exposure all season, but with high expectations considered, going out with a bang won’t hurt. The Bulls’ top long-term guy is Massinburg, who has a good physical profile, can shoot it, and has an outside chance at some NBA success if he lands in a good situation. He’ll end up with a good matchup no matter what, drawing either ASU’s Luguentz Dort or St. John’s’ Justin Simon depending on the First Four. With Bol Bol out for the season, the Ducks’ headliner is King, a long, skilled freshman wing who has a chance at the first round and has been mostly good of late. He stands to benefit the most from added exposure this month after Oregon escaped a mediocre Pac-12 tournament to steal a bid. Happ’s size and skill make him an intriguing NBA flier, although he can’t shoot a lick. Wooten is one of the most athletic players to ever pick up a basketball, and Oregon’s size up front should give Happ an interesting test. This is sneakily a fun game as far as prospects are concerned, with two potential first-round picks in Queta and Thybulle on the floor. Queta’s high-end physical length is sure to get him drafted at some point, and he’s enjoyed a solid freshman season after flying under the radar out of Portugal. Thybulle’s defensive impact is massive, albeit within Washington’s zone. Neither player is his team’s top scorer, with Merrill and Nowell both having quietly strong years. This is recommended viewing. 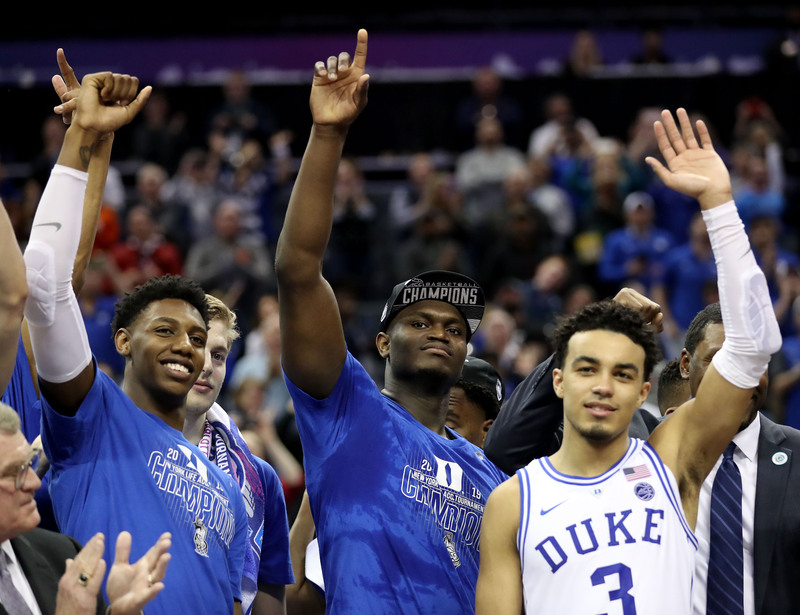 You’ve almost surely watched some Duke this season, and you’ll almost definitely get to see them play again after this, but this game has Zion in it…so you probably want to watch it. For as good a team as Houston is, they’re not replete with projectable talent. Jarreau, a 6’5” sophomore playmaker who comes off the bench, has looked like their best prospect, although his breakout may have to wait until next season. Georgia State relies heavily on Simonds, a fringy NBA prospect who struggles to shoot from outside, but can fill up a stat sheet. Liberty is legitimately pretty good, and Mississippi State can be a bit unpredictable at times, so this one could end up being closer. The guy to watch is Weatherspoon, who has been the Bulldogs’ steadying force all season and has some sleeper appeal at the next level with his size, toughness and three-point shooting. He can be turnover-prone, but he’s managed double figures in all but three games this season. Also keep an eye on Aric Holman, who fell off a cliff in the second half but has some pro potential with his size and ability to stretch the floor. You’ll probably be seeing a lot of North Carolina this month, and they’ve been worth the watch—White has a chance to be the tournament’s breakout star, Johnson might be the best shooter in the country, and Little is good for a couple highlight plays a game. Then again, you can probably just watch the Tar Heels again on Sunday. Neither of these teams has a ton of NBA talent, but the 7’6” Fall does have some level of appeal in the Boban Marjanovic sense—he moves well for his size and is a load to deal with, although he can’t shoot at all. VCU’s swarming defense will be a challenge for him. It looks like Iowa State has figured itself out again, and the Cyclones have a ton of talent on the roster, headlined by the freshman duo of Horton-Tucker and Haliburton (both of whom have legit NBA potential) and largely carried by Shayok, who’s having a remarkable year shooting the ball. The Buckeyes are well-coached and should be a tough test, and Wesson has a chance to feast inside. This could be one of the better games of the night. The Hokies are supposed to get Robinson back at long last, which means Alexander-Walker (a projected first-round pick) can move off the ball, which makes them a much more dangerous team. This is one of the better backcourts in the country at full strength, and both players could end up on NBA rosters this fall. Saint Louis stole a bid out of the A-10, but should present a really tricky test with their defense.